Bringing the pro-proven performance of the Dura Ace series to their Ultegra 11-speed groupset, the updated Ultegra rear derailleur features all of the performance of the Dura Ace 9100 rear derailleur with only a marginal increase in weight. The most notable update to come to this rear derailleur is Shimano's SHADOW RD technology, providing a low-profile design that optimizes the slant angle and keeps your shiny new derailleur safe from crashing. 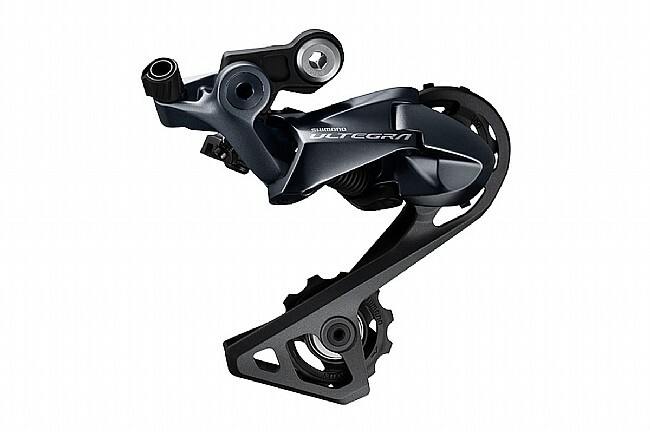 The Ultegra RD-R8000 11spd Rear Derailleur is available in two different versions, depending on what cassette gearing is prefered. The RD-SS covers cassettes from 11-25T to 11-30T, while the RD-GS is compatible with cassettes from 11-28T to 11-34T. Claimed weight: Ultegra R8000 RD-SS – 200g, Ultegra R8000 RD-GS – 310g.